Adventures in knitting and reading. 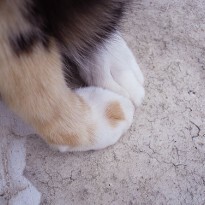 With cats. 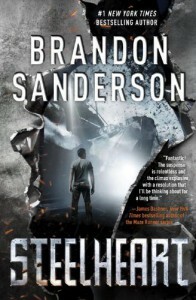 I have mixed feelings about Steelheart. 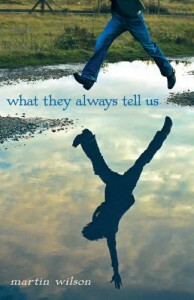 I liked the writing and the general premise of the book. As a reader of comics and lover of anything X-men related, I enjoyed the power vs goodness debates between the characters. I thought Brandon Sanderson handled it well and gave something more to the Super tropes. The plot was great and action packed and I even had troubles putting it down! The ending was fantastic. There were things that I didn't see coming. That said, my main problem with the book is the narrator. I know he is supposed to be a teenager but I really, really disliked David. I don't think he could be any more of a Mary Sue if he tried. His relationship with Megan is Nice Guy (TM) at best, bordering on harassment at worse. It got so ridiculous that it made me want to stop reading. The only thing that kept me going was the Reckoners. I loved how they interact with each others and it was good enough that I could read past David and focus on something else. I just can't help thinking it would have been a fantastic book if Prof had been the narrator. I will still read the sequel when it comes out, though. The last chapters gave me hope that David will grow and be a more interesting character. P.S: Headcanon for Prof? Jeffrey Dean Morgan (aka Papa Winchester). I don't know why but I kept imagining him as Jon. I feel like the pace was a bit slow and the two points of views (brothers Alex and James) was unnecessary. I honestly couldn't care less about James' narration - who spends most of his time being a selfish, whiny boy - and would have love to read more of Alex. That said, I still enjoyed reading this book. It's a good story. I'm giving it three stars for the ending, who turned out to be far better than my expectations. Overall, I feel having thirteen books on a two years timeline is what made this series ridiculous and it's a shame, the first six books were fun. 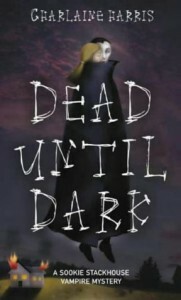 I watched the first two seasons of True Blood a year ago, and I was looking for a light read, so I thought Dead Until Dark would be just that: no surprises, I know the characters, where the plot is going, etc. I know, I know, colour me shocked, a book better than its adaptation? 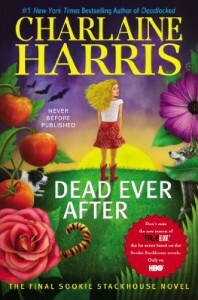 Anyway, I enjoyed this novel, it was a fun read and I am looking forward to Living Dead in Dallas. I've always enjoyed Neil Gaiman's "children" stories more than his adult ones (I never finished Neverwhere, for example) but I am really starting to appreciate his writing style. There is something bloody amazing about the way he writes and How to Talk to Girls at Parties' storytelling clicks all my buttons: it's interesting, short and fills your head with imagination. The Ocean at the End of the Lane excerpt was really good too. I have pre-ordered my copy and I can't wait to read more. 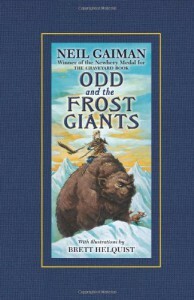 "Odd and the Frost Giants" is a wonderful little fable about a boy named Odd, three mythological gods and one frost giant. It is a quick and fun read with a very nice ending and I'd recommend it to anyone who loves fantasy, Neil Gaiman or has children. Helquist's illustrations are really good, even on my kindle. 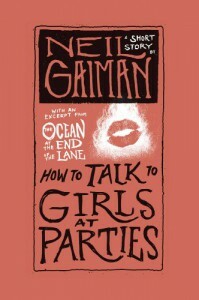 Whoever wrote Neil Gaiman's biography at the end made me laugh out loud. I enjoy short stories because they set my imagination reeling and I like trying to figure things out, especially with Science Fiction. 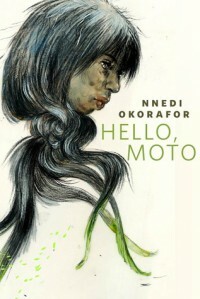 Although "Hello, Moto" is a good and solid piece of science fiction and everything I like about short stories, I did not enjoy the cliffhanger ending. It lacks a proper ending and it leaves you with nothing.